On April 8, 2019 at 14:00 the general seminar of IIAP will be held. On the agenda there is the report of Andranik Mkhitaryan on "ՀԻԲՐԻԴ ԻՆՖՈ-ԿՈՄՈՒՆԻԿԱՑԻՈՆ ՀԱՄԱԿԱՐԳ՝ ԷԼԵԿՏՐՈՆԱՅԻՆ ՓՈՍՏԻ և SMS ՏԵԽՆՈԼՈԳԻԱՆԵՐԻ ՀԻՄԱՆ ՎՐԱ. ՄՇԱԿՈՒՄ և ՀԵՏԱԶՈՏՈՒԹՅՈՒՆՆԵՐ". On April 4, 2019 at 13:00 the general seminar of IIAP will be held. The report of Aghasi Poghosyan on "ԹՎԱՅԻՆ ՊԱՏԿԵՐՆԵՐԻ ԻՄԱՍՏԱԲԱՆԱԿԱՆ ՎԵՐԼՈՒԾՈՒԹՅԱՆ ՄԵԹՈԴՆԵՐԻ ՄՇԱԿՈՒՄ ԵՎ ԻՐԱԿԱՆԱՑՈՒՄ". 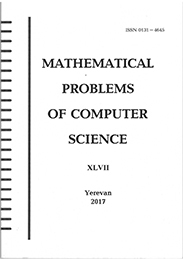 The report of Sejozha Asryan on "ԿԱՏԱՐՎՈՂ ԿՈԴՈՒՄ ՍԽԱԼՆԵՐԻ ՀԱՅՏՆԱԲԵՐՄԱՆ ԴԻՆԱՄԻԿ ՎԵՐԼՈՒԾՈՒԹՅԱՆ ՄԵԹՈԴՆԵՐ". On April 2, 2019 at 14:30 the general seminar of IIAP will be held. On the agenda there is the report of Karen Mkhitaryan on "Համայնքների հայտնաբերման խնդիրների ինֆորմացիոն տեսական հետազոտում և խորհրդատվական միջավայրի մշակում". 2019թ. մարտի 21-ին ժ. 14:00-16:00-ը Ինֆորմատիկայի և ավտոմատացման պրոբլեմների ինստիտուտում անցկացվելու է գիտական սեմինար հետևալ թեմայով. "Lessons learnt from the FabSpace 2.0 experience (FabSpace 2.0 concepts, carried on activities, lessons learnt). FabSpace is an open-innovation network for geodata-based innovation – by leveraging Space data in particular in Universities 2.0. It is a one-stop shop-access to Space data and a wide range of other data as well as free software and data processing tools to develop new digital applications". Seminar of Department for Information theory and statistical models will be held on the topic: "Information-Theoretic Investigation of Community Detection Problems and Recommender Framework Development". Reporter: PhD student Karen Mkhitaryan. Զեկուցողն է՝ պրոֆ. Գենադի Մալաշոնոկը (Геннадий Иванович Малашонок, Заведующий лабораторией алгебраических вычислений Института математики, физики и информатики, профессор кафедры компьютерного и математического моделирования Тамбовского государственного университета). Seminar of Department for Information theory and statistical models aimed for innovation will be held on the topic: "The three-body problem in the Riemannian manifold. Hidden irreversibility in classical mechanics". Reporter: Prof. A.S. Gevorkyan.